I am planning to move our very small Moodle instance to Windows soon, in an effort to ease the use of Active Directory and possibly single-sign-on with Kerberos. Thanks for the comment – we look forward top hearing about your implementation adn experience. Great works as always, Alex! Surely of great help! But I see missing piece, SPS integration with Moodle. So any future plan to put it in? Thanks for the comments, I hpoe you enjoy read and find the ebook useful. 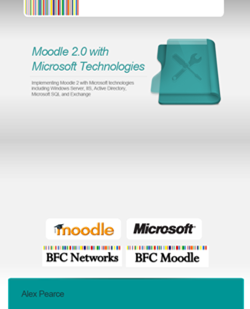 Great work, but I want to ask can we connect Moodle 2.0 with live@edu accounts? Hi Alex. Any news/timeline about the SharePoint 2010/Moodle 2 integration?